"I wasn't sure I liked the sound of it. Even my vivid imagination could hardly fathom a place as tight, or dense, or narrow as Shanghai." 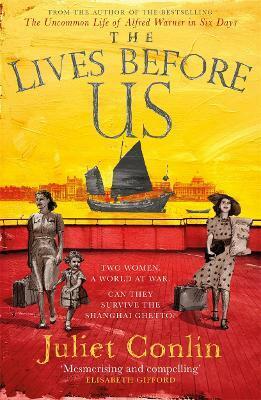 It's April 1939 and, with their lives in Berlin and Vienna under threat, Esther and Kitty - two very different women - are forced to make the same brutal choice. Flee Europe, or face the ghetto, incarceration, death. Shanghai, they've heard, Shanghai is a haven - and so they secure passage to the other side of the world. What they find is a city of extremes - wealth, poverty, decadence and disease - and of deep political instability. Kitty has been lured there with promises of luxury, love, marriage - but when her Russian fiance reveals his hand she's left to scratch a vulnerable living in Shanghai's nightclubs and dark corners. Meanwhile, Esther and her little girl take shelter in a house of widows until the protection of Aaron, Esther's hot-headed former lover, offers new hope of survival. Then the Japanese military enters the fray and violence mounts. As Kitty's dreams of escape are dashed, and Esther's relationship becomes tainted, the two women are thrown together in the city's most desperate times. Together they must fight for a future for the lives that will follow theirs. Juliet Conlin was born in London and grew up in England and Germany. She has an MA in Creative Writing from Lancaster University and a PhD in Psychology from the University of Durham. She works as a writer and translator and lives with her husband and four children in Berlin. Her novels include The Fractured Man (Cargo, 2013) and The Uncommon Life of Alfred Warner in Six Days (Black & White Publishing, 2017).